Robert John Fakler, 52, of Baldwin, passed away Monday, April 1, with his close friends Bill and Lois Cobb and Adam Fuehrer at RJR Maintenance and Management in Mandan. Robert was born to John “Jack” Conrad Fakler and Marie Rose Krous Gabel on Feb. 20, 1967, in Dickinson. The family soon moved to Williston, where he grew up enjoying the outdoors, hunting, fishing and anything to deal with agriculture. He spent many summers on the Krous Farm baling hay and working cattle and was president of the Williston FFA chapter. Robert met Jacqueline “Jackie” Joy Nasers his senior year at Williston High School and they both moved to Arizona shortly after graduation. They married on July 4, 1986, so they could always have fireworks on their anniversary and Robert could always remember the date. They were happily married for 33 years and had two children, Thomas “TJ” John and Jamie Michelle. As the family grew, Robert and Jackie moved back to North Dakota in 1994 to be close to family and friends. Robert has always had the soul of an entrepreneur and has embarked on many adventures throughout his life. He started Anything for a Buck where he engineered/invented a new irrigation system and worked for a start-up fertilizer company. 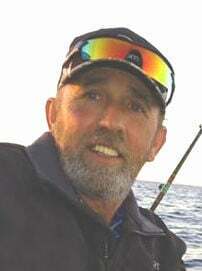 He had partnerships in a tackle company called Master Angler Tackle and a septic truck business called RJ Septic. All these experiences, including 17 years managing mobile home parks, led him to find his passion in RJR Maintenance and Management. Robert and Jackie purchased RJR in 2011 and opened the doors in January 2012 with a staff of three employees. His determination, dedication and most important of all, hard-work ethic, grew RJR Maintenance and Management into a company of 33 employees, all of whom he considered his close family. He also rediscovered his passion for agriculture, leading to his dream hobby farm in Baldwin. He took great pride in his livestock and lived to share his joy for agriculture with his grandchildren, who called him “Papa” and the cattle “Papa Cows." His last great venture was RJ Short Horns, which he planned to build with his son-in-law, Joey, and grandchildren. He was exceptionally proud of all his children for the accomplishments they fulfilled in life. Robert is survived by his wife, Jackie; son, Thomas (Theresa Goering) Fakler, daughter, Jamie (Joey) Binstock; mother, Marie Krous Gabel; three siblings, Vincent “Butch” (Julie) Gabel, Deanna Finnie and Richard (Chassidy) Fakler; five grandchildren, Tate Binstock (6), Hunter Binstock (5), Brooklyn Binstock (2), Theodore Fakler (10 months), and Wyatt Binstock (3 months); uncle, Tom (Bev) Krous; RJR employees; and many other extended family members and friends. Robert was preceded in death by his grandparents, John and Sally Krous, John and Clara Fakler; fathers, John “Jack” Fakler and Vincent “Vince” Gabel; sisters, Jean and Marie Fakler; granddaughter, Faith Binstock; and uncle, Daryle Krous. Go to www.eastgatefuneral.com to share memories of Robert and sign the online guest book.